Take them to the local Goodwill or St. Vincent’s store. Boy scouts and other groups looking for projects will collect the parts and make the trophies they can use for their annual events. Some dusting and new engraved plates and they will be good as new! Use them as garden decorations. Kind of like gnomes, only more “sporty”. Take them apart and use the components in craft projects. It’s amazing what some people can create! Being named employee of the month is a great honor. It lets the employee know they are appreciated for what they do. It is a pat on the back for a job well done. It pumps up their confidence and most likely improves their performance. And by recognizing an employee for their work, it becomes a contagious event. Everyone wants to be recognized for what they do, and if, by doing a little more, or doing something a little better, they can be publicly recognized for their efforts, they will have plenty of incentive to go the extra distance. The amazing thing is that is costs very little to recognize an employee for a job well done. The return on investment is huge. The collateral returns are immense. The positive impact it has on the culture of an organization are great. So why would any organization NOT want to recognize their star performers? We just introduced Black Star Trophies to the QuickTrophy lineup. They feature the same design found on our Black Star medals but the design is expanded and built into a 5″ black and gold figurine. We currently offer the Bla ck Star Trophy design for Cheer Leading, Soccer, Softball, and Baseball. Football and Academic themes will be introduced next week. We will then expand the line based on customer demand. The figurine is mounted on a black marble base and looks pretty sharp. 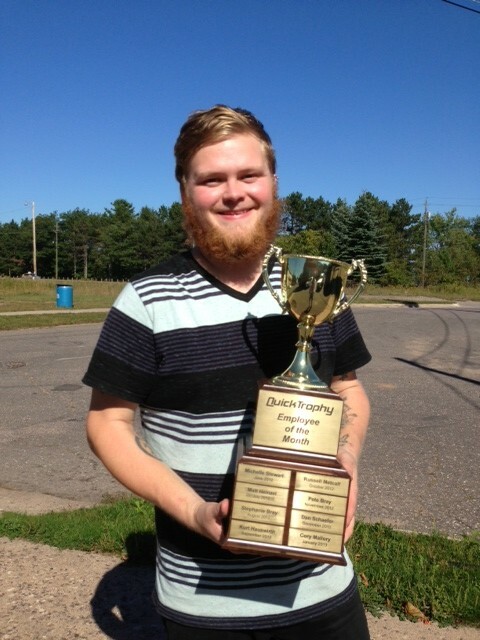 The black star trophies can be found on the QuickTrophy web site under the sport (baseball, soccer, etc.) and listed within the Economy Section. The construction of these trophies makes them very affordable. They are perfect for tight budgets or for participation trophies for youth athletes. Present your sports athletes with something a little different and exciting. Check them out on our web site and let us know what you think. 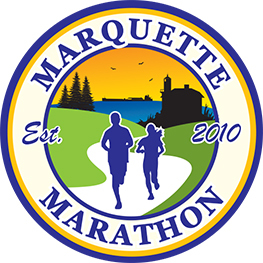 QuickTrophy is proud to be a sponsor of the Marquette Marathon, Half-Marathon and Relay Race to be run Saturday, August 31st, 2013. The race course starts at Presque Isle, follows the lake shore to the North Country Trail, then connects to the bike path around the town leading back to the lake shore down town. From there is heads south through Founder’s Landing then back along the lake shore bike path to Presque Isle, looping around the “island” to the starting site. It is a beautiful course and three lighthouses can be seen along the Lake Superior shoreline. A half-marathon is one loop, a full marathon is two loops. The course is mostly paved, relatively flat (with the exception of Presque Isle), and fast. Proceeds of the race are used to benefit the local high school programs. At QuickTrophy we celebrate birthdays with a birthday cake. We have one cake per month and celebrate all the employee birthdays for the month at the same time. In July we had 4 employees with birthdays so it was a big celebration with an Oreo Cake. But what happens when you have a month without birthdays? This happens sometimes so what do you do? Skip the cake and say “Too bad”, or have the cake and celebrate all the un-birthdays with an un-birthday cake? Thanks to Lewis Carroll, and “Alice Through the Looking Glass”, we all have lots of un-birthdays! 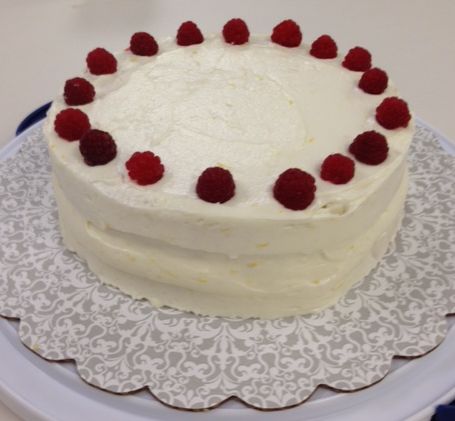 In August we celebrated everyones “un-birthday” with a Raspberry Cake! A delicious white lemon cake with fresh raspberries between the layers and on top paired with a lemon butter cream frosting. A delicious creation of “Jule of a Cake” by our own past employee: Julia. Seems like the un-birthday cake is loved and appreciated as much or more than the birthday cake! What is the lifespan of a trophy or award style? It seems like bobble-heads came and went during a 2-3 year period around 2005 or so. Some resin awards were impossible to keep in stock for a while and now you can’t give them away. At the same time the old standby – the figurine on a marble base – has been around for decades and is still one of the most sought after trophies. What evolutionary law of popularity determines what’s hot and what’s not and for how long? We used to sell hundreds of simple black acrylic awards with a matching black and gold holographic decal depicting various sport themes. 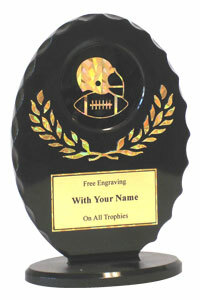 Shown in the picture is one of the football acrylic awards. The awards came in two sizes. Their popularity waxed and waned with the collective preferences of the coaches and team mom’s across the country. Well, rather than try to figure out the laws of pop culture, it is best to just ride the waves and know when it is time to pull the plug. Time to discount and make room for new stuff. So get the football acrylic awards while we still have them! Bocce Ball has been popular in Europe for millennia, dating back to ancient Roman Empire times. It is especially popular in Italy and around the world where people of Italian ancestry have relocated. In the United States some urban areas have bocce ball courts that are maintained and used quite heavily. In recent years it seems to have become increasingly popular among the population at large. At weekend gatherings, picnics, and family reunions, bocce ball is a popular pastime. We have noticed an increase in the use of bocce ball awards and trophies for family events as well as larger organized tournaments. Anytime there is a recurring event, people like to commemorate it with a trophy – and what better way to commemorate a bocce ball tournament than with a perpetual trophy to keep accurate records on past winners and give future winners something to strive for! For smaller events, like family reunions, summer picnic outings, or city leagues, smaller bocce ball awards may be more appropriate. 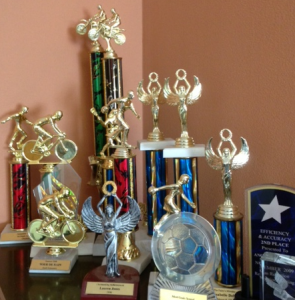 At QuickTrophy we have a pretty nice selection of trophies. And if you don’t see something you like, just call us and maybe we can put something special together for you. A long standing tradition here at QuickTrophy is warm, fresh cookies baked for break time on Friday mornings. We have a convection oven in our break room so I bake them fresh every week. I do it as a way to say “Thank You” for working hard all week – to show I appreciate their hard work. It is a little gesture, but an important part of our culture here. A culture that values each other, shows respect for each, and consideration for each other. A culture that feels like a family. I often think of when I would fly Midwest Express airlines and they would bring by fresh baked chocolate chip cookies. It was a great indulgent perk worth big bucks to me – but probably only cost them pennies per person. It had a huge ROI. Likewise, showing appreciation for the work someone does is always worth way more than the cost involved. 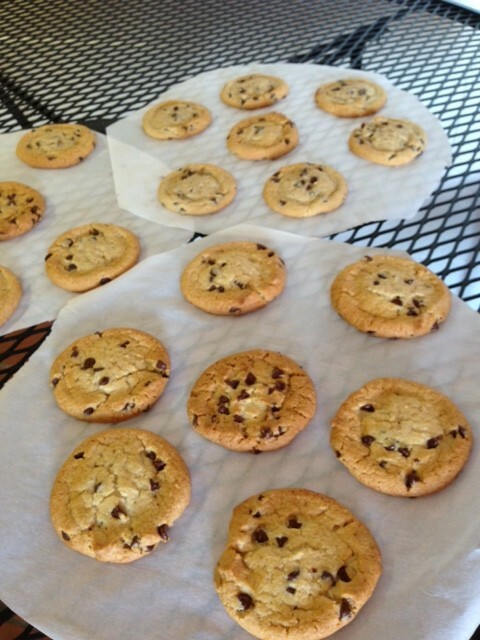 Plus – everyone loves fresh cookies, be they chocolate chip or any other flavor. Author Terrence DehringPosted on August 16, 2013 February 22, 2016 Categories Employee Recognition, QuickTrophyLeave a comment on Fresh Cookies! We just launched a new line of walleye trophies and awards featuring the artwork of Steven Trofka. The Walleye trophies and awards show a walleye fish ready to attack a fishing lure. It looks very realistic and inspiring, if you are a walleye fisher! Living in Minnesota, Steven has several paintings depicting fish and wildlife found in the surrounding lakes and woodlands. Steven displays and markets his work through the web site www.artbizbee.com. Walleye fishing has always been popular in the north country but lately there have been more and more walleye tournaments. What better way to commemorate and congratulate the winners of the tournaments than with a walleye trophy? 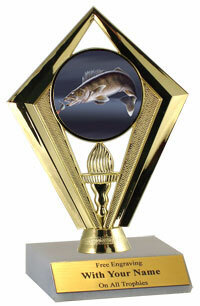 See our full line of walleye fishing trophies and other fishing trophies at QuickTrophy! Bob Jacquart of Jacquart Fabric Products in Ironwood, Michigan gave a presentation in Marquette recently. He recounted the history of the company he grew from a family sewing shop to an producer of clothing products distributed worldwide. The product that catapulted the company to stardom was a little hat known as the Stormy Kromer. Originally used by rail employees in the extreme upper mid-west, it has been revived and found popularity among the young outdoor enthusiasts of the world – much like Patagonia or the North Face. Production of the Stormy Kromer line of products has nearly doubled the size of the company and given the company a name with strong brand recognition. Jacquart Fabric Products is now a major employer in a geographic area that has experienced chronic high unemployment for decades – similar to QuickTrophy. Once the mark of a manly woodsman or hunter, the Stormy Kromer is now an icon for people who love and live in the great outdoors. A well made, truly American product!